“On the Road to Health” is a program that was established by Voice of Calvary Ministries. The aim is to promote healthy life-styles across the entire metro area. Phil Reed is the president and chief executive officer of Voice of Calvary Ministries and every year he rides the trace based on his age. So this year, at age 60, he will be riding 60 miles on a bike. Impressive! If you are interested in riding, then click on the registration form above and print. 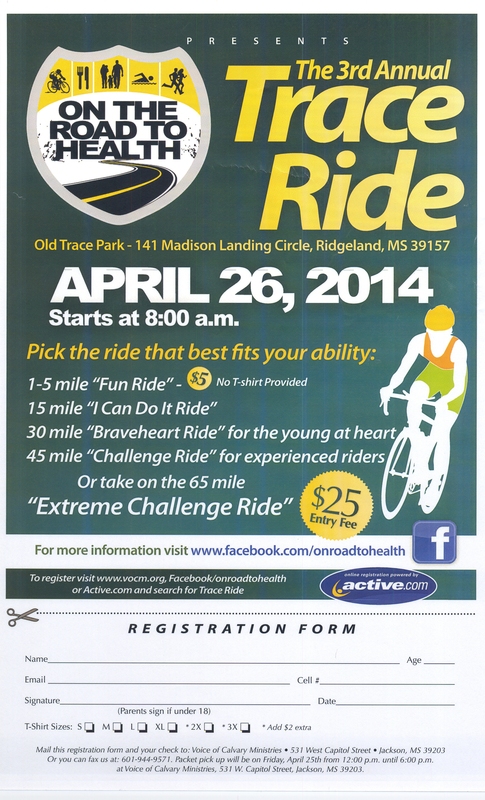 The ride will kick off at 8:00 a.m. on Saturday, April 26th. Voice of Calvary Ministries is located at 531 W Capitol St.